We are in for another major snowstorm this weekend, but I am definitely happy it's March so hopefully this snow won't last long. I am SOOOOO tired of snow days. My hubby told me last night I'm going to have a "Spring Day" instead of a "Spring Break" this year and that just makes me sad...especially if the weather is nice that week. To celebrate March, I am joining Farley's March Currently party! I have the tv on, but I'm not paying much attention. I'm more focused on going back and forth between blogging and Pinteresting! I love that it's March, but not looking forward to the snow this weekend as I mentioned above. I need to get ready for my observation in a couple weeks. I have a student teacher right now, so I'm not completely sure how this will all work. But I want to be prepared and ready to go early! Can you guess my question???? The answer is organize, clean out my closet, and laminate! 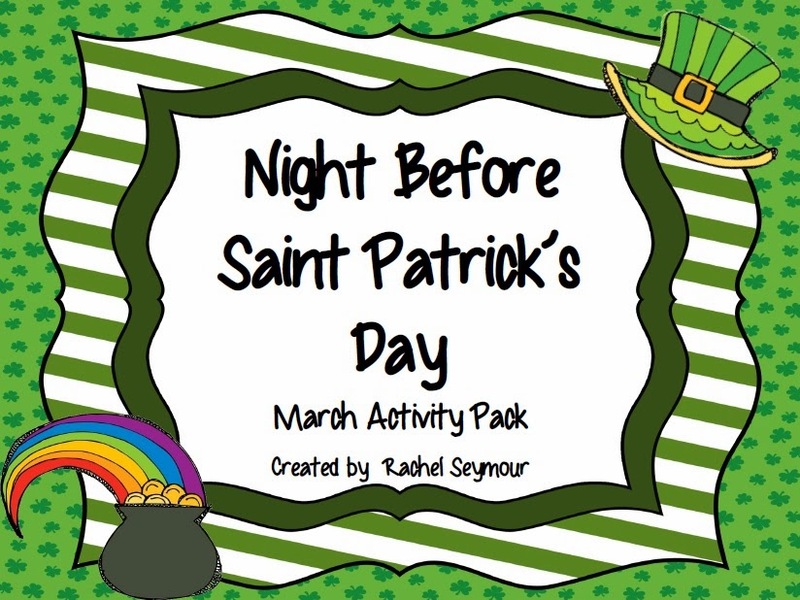 Make sure you grab my *FREE* Night Before Saint Patrick's Day Pack for this month! I want to share a couple more pictures with you from our science fun this week! We ended our learning about the states of matter yesterday and my kiddos had so much fun with it! 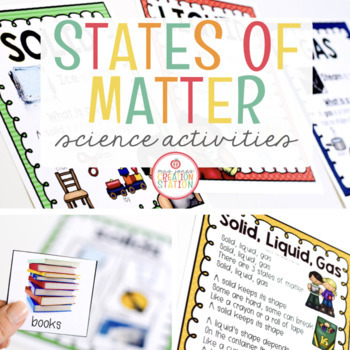 These experiments are found in this wonderful States of Matter Pack. Just click the picture to go purchase it on TpT! Yesterday we made purple fizzy cows which my kids were thrilled about. They contained all 3 states of matter: ice cream as a solid, grape pop as a liquid, and bubbles as a gas. Great way to end states of matter! Well, I am off of here! I need to go shopping and get out of the house before another big snow storm comes through and pummels us with snow again! Good luck with you upcoming observation! Being prepared is such a wonderful feeling. Shoes wear out so fast, I'm amazed at how quickly I wear mine out. Hope you find some good ones today. I'm right there with you on the snow. Blech! 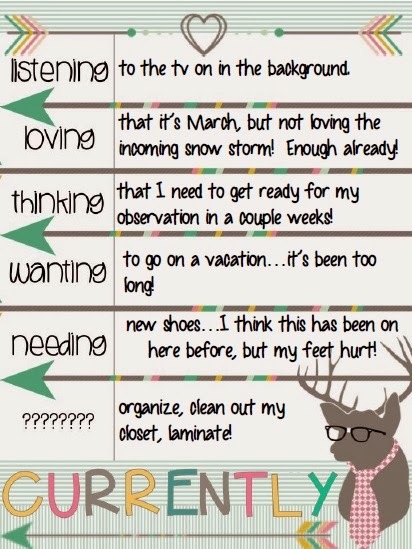 I'm guessing that you last one is your snow day to-do list? I have found some wonderfully comfortable shoes from Payless. I bought three pairs!!! They have a great foam core which molds to your feet. They are wonderful. I am guessing that your question is either What do I need to do? OR What do I dislike doing? Good luck with the snow. We are supposed to get 2-4 inches today. So ready for springlike weather. I love your idea for the three states of matter! In addition, I too am not looking to this snow storm we are getting. It is snowing now, but I live in a different county than what I teach and they are looking to get nothing and we are looking to get a ton of snow. I am not looking forward to tomorrow morning. I was wondering if you could please check out my new teacher exchange website LIFTPackages.blogspot.com. It is a teacher exchange program in which you meet teachers and send care packages to each other. Please feel free to check out the website, sign up and pass our name along to friends! Love the purple cows for the three states of matter! So smart. The ice cream idea was a great way to end the unit! It is a fun activity, with much educational value as well. I love that first graders are learning about this at level, and I know that sixth graders also would have a blast with these activities as well!